Life's Journey To Perfection: "POP" Cake, great for Father's Day, Birthdays, or any gift really! 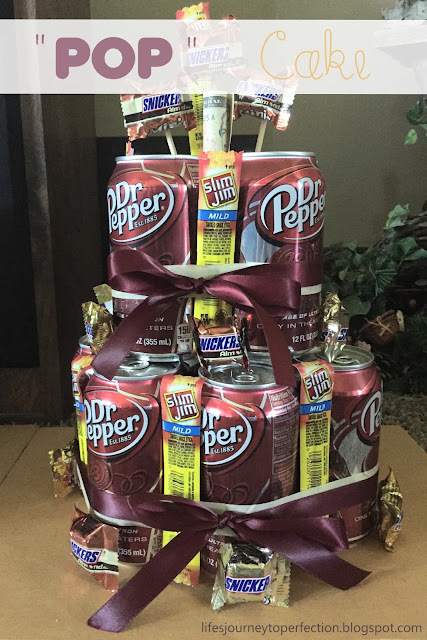 "POP" Cake, great for Father's Day, Birthdays, or any gift really! For Father's Day I try to always do something that is fun and something that the dad's enjoy. These "POP" cakes could also be used for, birthdays, graduation, teacher appreciation, etc. Card board, Foam Board, Wood, cutting board, or pizza stone/tin for the base. I used cardboard, because that is what I had on hand (I had forgotten to get the pizza tin at the store). My cardboard measures, 14 inches by 11 inches. 12 pack of you favorite pop/drink. Start by rolling some duck tape and placing it in the center of the card board. I did four pieces of duck tape rolls, so it would secure the pop to the card board. Place one can of pop in the center and then seven cans of pop circling it. Using masking tape go around all the cans to hold them together. Now for the second level, place some more duck tape on the top of the cans and place four cans on top to form the second level. Using masking tape go around the four cans to hold them together. Tie your ribbon around the cans.